Relative performance of sectors (or stocks/ETFs) vs their 52-week highs — s.c.a.n. Is there a way to put several sector ETFs or stocks on one perf chart showing their respective performance vs their respective 52-week highs? I don't know an easy way to do it. In theory, you could download the data and calculate the differences in excel and upload the results as user defined indexes (if your subscription allows). Maybe someone else has a better idea? Thanks. I've been doing it manually, chart by chart using the %change on the annotation application. Was just hoping there'd be a quicker way to look at multiple securities at once, each vs their respective 52wk highs. I'll try your idea of Excel>upload>UDI. Thanks for the idea! Well, another possibility is to make a Candleglance style that includes price channels. If it's daily, the price channel parameter would be 251, or weekly would be 52. A potential problem is if the chart time frame is too short, the upper price channel won't show. A way around that is to use Fast Stochastics instead, with parameters 251,1 for daily, or 52,1 for weekly. Stochastics shows where price is in relation to the range of the specified period. So, for instance, if XYZ is near the top of its 52 week range, %K will be in the 80s or 90s; if it's mid range, in the 40s to 60s, and so on. Thanks again! I was unfamiliar with Price Channels and Fast Stochastics, so thanks for introducing them to me. Both are good tools to get close to the goal of finding out a securities current pxe vs it's high of a particular range. It still doesn't accomplish what I had set out with, which was easily assessing in one perf chart, how various ETFs or securties are doing vs their respective 52-wk highs. But the Price Channels in particular are something I'll add to my default chart as a way of immediately seeing where the security is vs its 52-wk high/lo. BTW, i have also used PP0, and only used two parameters PPO (1,200) as a way to see where the most recent one day price is relative to the average of the past 200 days...again, not what i was after, but yet another useful gauge in getting a picture of relative performance for an individual security vs some past time period. The advantage of the Stochastic indicator is it actually gives you a numerical value. In fact, you could run a scan on a list of ETFs ranking by Fast K and it would list in order those closest to their respective highs. Then put the results in a list and candleglance it so they appear in order best to worst. You could do it two different ways. This way would express the location as a per cent of the total range, with the highest value being the closest to the high; in other words, the per cent of the range above the low. e.g. right now Utilities are closest at about 74% above its low and Materials the worst at about 4%. That would give you the per cent off the high, so the lowest per cent would be the best - so Utilities would be about 26 % off its high (as a per cent of *range*, not price) and Materials 96% off. You can sort the results on the rank by column ascending or descending, then replace your list, preserving the sort order by checking the box. Wow! Great idea! Thanks for your help. Really appreciated!! Just a comment. markd is amazing. A visual that might help perhaps, is one I use related to Price Channels. I love them. I display them as an Area. I use two price channels. A short/intermediate term (like 8 or 13 week), and the 52 week. Color them the same color and make the short term a level or two higher in Opacity than the 52. This will show you a couple of things quickly. It will show you where the short term (more current) activity is compared to the 52 week range. If you see the lighter color of the 52 price channel above and/or below the short term channel (darker color) you can tell approximately where the security is currently trading within it's 52 week channel. I do mostly all of my "line chart" work on Weekly and monthly charts as a supplement to my Point and Figure chart work. Also, flat spots in the top and bottom of the channels show you where support and resistance may lie. I like to view longer flat spots as where SOS and SOW in Wyckoffian terms can appear. I incorporate an awareness of different price channels into scans and alerts as well as my charts and custom CandleGlance. 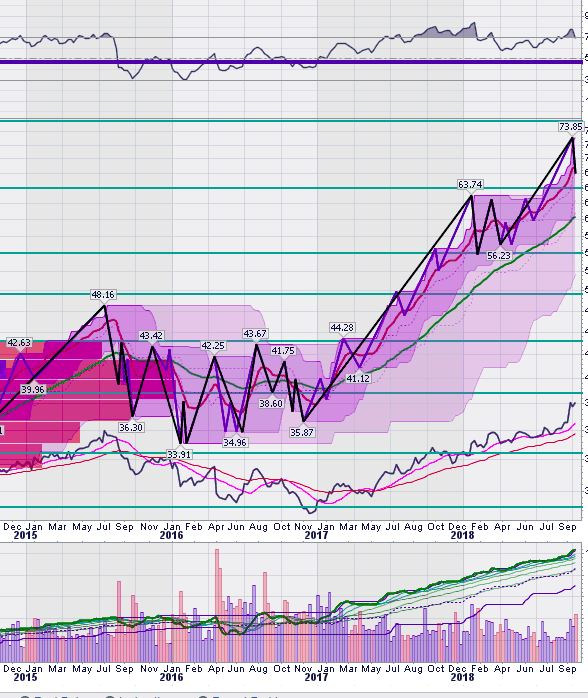 I've attached a Snip of a weekly chart of ABT. You can see where the short term and the long term channels appear. Zigzag lines display what I try to interpret in a Wyckoffian way. 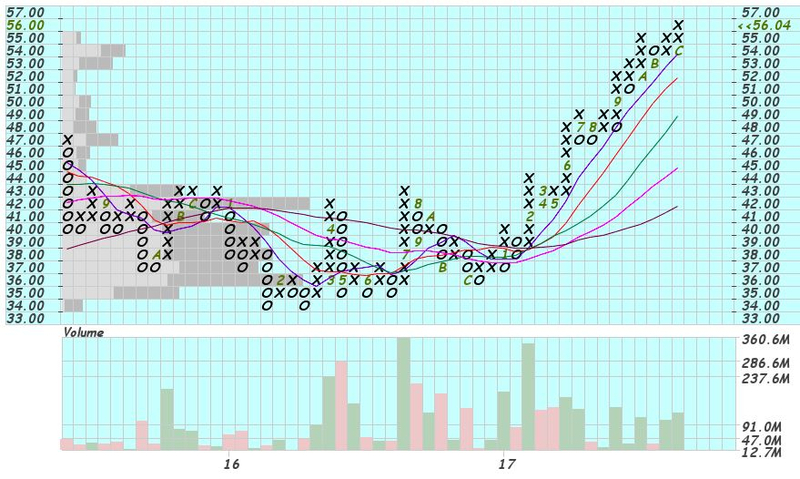 This is the 1 box reversal PnF chart for the "accumulation and breakout period"
Thanks! The 'visual' of the overlapping short/long Price Channels is a great idea!! And thanks for introducing me to "Wyckoff"....new to me. Really appreciate the ideas and help!! markd and lmkwin...thank you both! I have been using your suggestions and learning a great deal about how to get much more value out of StockCharts. Still have MUCH to learn, but you've both set introduced me to totally new features. Thanks again!! The value you get from StockCharts.com is immense, in my opinion. @_personalviews, I had some great teachers who taught me that the best way to learn is to practice, experiment and ask questions. I include markd in my group of teachers.